The bulkhead is made from fiber reinforced polymers. It sits flat on the pool floor when it is not in use. The bulkhead can be raised by introducing compressed supplied airlines into the bulkhead. 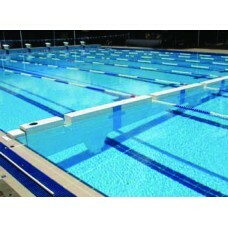 The ability to span either half of the pool or whole one. This leads to a greater flexibility for pool programming.